The starry night sky takes your breath away. Cancellation policy Cancellations made after the application deadline due to personal reasons will incur a 100% cancellation charge. Customers wishing to cancel should contact us before 6:30PM on the day of the tour. Summer: It may get colder than you expect as the seasons change, so please dress warmly. Winter: Please wear warm winter clothing such as skiwear, hats (which cover the ears), gloves, boots, neck warmers, etc. 1. 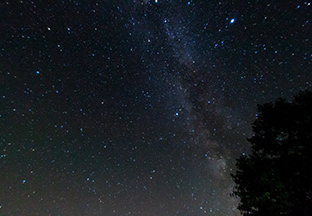 If star-watching is not possible at Lake Mashu, a night tour of Mt. Io will be held instead. 2. If the tour is cancelled (due to inclement weather, road conditions, insufficient participation etc.) you will receive notification by 6:30 PM on the day of the tour. 4. Mt. Io night tour (if star-watching is not possible at Lake Mashu).